I didn't think we would have much news this week, but there is more than ever. I am going to start calling this a Wireless Messaging Online Magazine. Hope you enjoy it. Have you noticed all the promotion going on about Cingular's Enterprise Paging Service? They have certainly re-invented the wheel. They want us to think that this is something new and a good deal. Anyway, our Paging sales people need to be aware of what they are up against and they need to be prepared with ready answers for their customers. Read about Cingular's "Paging" service here. We can's just roll over and let them take our customers away without a fight! This week there are three main pages in the newsletter. In the top right-hand corner of this page you will see: “Page 1 2 3.” This indicates that you are on page one and that you can click on either the “2” or the “3” (because they are underlined) to go to those respective pages. When you are on page two you will see: “Page 1 2 3” and when you are on page three you will see: “Page 1 2 3.” Also, at the end of page one there is a link to page two, and at the end of page two, there is a link to page three. I hope this makes it easy for everyone to read through the newsletter and then go back to find things of special interest later. On page 2 of this issue there is an excellent new whitepaper by Infostream in Australia: PAGING AS A PLATFORM FOR PUBLIC SAFETY RESPONSE. I highly recommend that you read this important paper. It is very well written. We can look forward to more innovative and interesting articles in the coming months. Note to my Aussie friends: Could someone please give me a list of the exact national paging frequencies and protocols being used down under. I think they can be counted on one hand and I need them by Monday if possible. Thanks. American Association of Paging Carriers! It has been a busy three weeks for the staff of xG Technology™ as it introduced its xMax broadband system to the public. The first demonstration of xMax™ was scheduled for November 3 in the Ft. Lauderdale/Miami area, but it was touch-and-go following the devastation to that area caused by Hurricane Wilma the week before. Damage to the tower housing the xMax transmitting omni-directional antenna meant that the xG technicians were only able to get to their equipment the day before the scheduled demonstration. Observers, including journalists, investors, and analysts from the United States and Europe, gathered in Ft. Lauderdale for the demonstration and they weren't disappointed. In the most compelling part of the day-long program, the xG Technology staff used its xMax platform to broadcast a data stream equal to full-motion MPEG-2 video with stereo sound at a distance of 18 miles using only 50 milliwatts of power. The transmission went across approximately 17.5 miles of the Ft. Lauderdale and its suburbs and a half mile of the Everglades. Covering more than 1,018 square miles, the low power digital broadcast was sent using the ISM 900 MHz unlicensed spectrum—a notoriously crowded and interference prone band. The demonstration also included a brief introduction to the xMax modulation technology by Princeton professor and IEEE Fellow Dr. Stuart Schwartz and a discussion of market implications by Robert Syputa, principal with the wireless broadband analysis firm Maravedis. Extensive questions and answers from reporters and others were handled throughout the day. Press reports of the demonstration were positive and caused a flood of inquiries from interested companies and researchers. The reporters covering the event did raise a question (that’s their job!) in regard to not being able to see the equipment at the transmitting end, only the receiving end. We considered that a valid issue and so on November 10 xG Technology held a second public event to verify the results. Again, observers from the United States and Europe were on hand to witness the demonstration. In this case, however, an editor from a well regarded industry publication climbed the 50 foot ladder to reach the elevator on the tower for a 20-minute ride to the top of the 850 foot tower. Once there he was able to observe and photograph the omni-directional antenna, the transmission levels, and other equipment. Using a cell phone he was in contact with an independent observer at the receiving end. The previous week’s results were confirmed EXCEPT that broadband transmission of 3.5 Mbps was achieved at an even lower power level—35 milliwatts! On November 16, the results of the demonstration and additional information about the xMax technology were presented in the U.K. at a packed Cambridge University forum on new wireless broadband technologies. The xG Technology staff is now developing a schedule of presentations and demonstrations for the next several months. For additional details, please visit http://www.xgtechnology.com. LIBERTYVILLE, Ill., and BELLEVUE, Wash. —Taking the coveted RAZR design to a new level of fashion and sophistication, Motorola, Inc. (NYSE: MOT), a global leader in wireless communications, and T-Mobile USA, Inc. deliver vibrant color to the famed mobile with the arrival of the MOTORAZR Magenta—available beginning Friday, November 25, only through T-Mobile. Flaunting an eye-catching look, the stunning RAZR Magenta is sure to top wish lists this holiday season. Like its predecessors, this new mobile features the famous RAZR slim shape, premium metallic finish and advanced technology such as photo messaging* and BluetoothÂ® wireless technology. 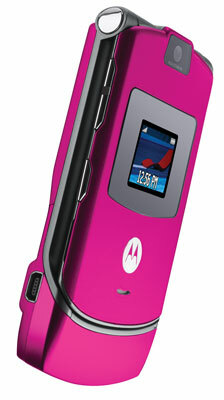 "The new, bold-yet-chic color adds a sense of flair to the RAZR family," said Jim Wicks, vice president, Consumer Design Experience, Motorola, Inc. "Building on the global success of the RAZR, this handset works hand in hand with T-Mobile's service for a full communication and multimedia experience." Michael Gallelli, director and head of product marketing, T-Mobile USA said, "T-Mobile customers want to lead the pack by owning exciting, fashion-forward and feature-rich mobile phones. The MOTORAZR Magenta is the latest robust offering that empowers our customers to talk, message and download with style." The Motorola RAZR Magenta touts the same performance excellence as the original model, boasting features like a VGA digital camera, picture caller ID*, MPEG4 video playback and quad-band world-phone technology. 2Wayhelp.Com has launched an activation amnesty program to help the deaf community and its families. Starting 11/15/2006 2Wayhelp.com will allow old customers from any 2way paging company to reactivate there pagers regardless of there old paging bill. (PRWEB) November 18, 2005—2Wayhelp.Com has launched an activation amnesty program to help the deaf community and its families. 2-Way Pagers in the deaf community is one of the low cost communications methods that promote a better quality of life. These units give the deaf community the freedom to move around and not be tie to a TTY system. You are also able to send and receive email from this wireless device. Two-Way pagers are compatible with text messaging with cell phones and some messaging service on the internet. 2Wayhelp.Com has received hundreds of call from the deaf community requesting the reactivation of there service and this request has finally been answered. Starting 11/15/2005 2Wayhelp.com will allow old customers from any 2way paging company to reactivate there 2way pagers regardless of there old paging bill. Some of the companies included in immediate over the air activation are Bellsouth, Weblink Paging, Metrocall Wireless, USA Mobility, 2waygadgets, Excel Communications and many others. A special link has been put on the website to assist and help in the reactivation of service. They can activate any 2way pager from any company but some pagers may require special programming because frequency differences in this case we will either trade out the pager or it can be mailed in for free upgrading and programming service. www.2wayhelp.com is able to turn on any 2way pager even two-way pagers from Skytel, Verizon, Arch, PageNet, Motorola and many more. 2wayhelp specializes in the repair and reprogramming of 2way pagers so they are able to offer a lot of different services for the deaf community and also offer extended warranties on used units. 2Wayhelp.Com still gives away free T900 Motorola Talkabout 2way Pagers to the deaf community at the following link http://www.2wayhelp.com/deaf.php. Motorola 2000X and Motorola Timeports are available upon request at a discounted rate. 2Wayhelp accepts donations of 2way pagers that are not being used any more. Donated 2way pagers are refurbished our facility and then donated back to the deaf community. We are currently seeking organizations to help in the distribution of our free pager program for the deaf community. Interested parties should contact our office [with] e-mail protected from spam bots, with their corporate information and any ideas they think would benefit the program. 22nd November 2005 - PageOne, the UK's foremost supplier of SMS messaging technology and services, today announces a partnership with Composite Data Solutions (CDS), a leading provider of outsourced field team management solutions. The partnership encompasses the integration of PageOne's Connect messaging product with CDS TeamHaven data capture and field team management product to provide a productivity solution for increasing retail sales. TeamHaven is a global solution, enjoying success in Europe and in the US with brands such as Coca-Cola, Nestle and Microsoft. The newly integrated SMS messaging solution will be initially implemented by specialist point of sale and field marketing firm, Field Sales Solutions (FSS). FSS plans to utilise this SMS functionality to manage and drastically improve the communication with the 170 Cadbury Trebor Bassett field sales staff it manages. Regularly visiting over 18,000 independent grocers, newsagents and convenience stores, FSS's Cadbury Trebor Bassett field sales staff use TeamHaven to capture and process data concerning confectionery merchandising for several thousand retailers every week. Kate Carr, Managing Director of FSS, the field marketing company that manages Cadbury Trebor Bassett's field merchandising team said: "We are really excited that CDS has decided to integrate PageOne's Connect SMS messaging capability within TeamHaven. TeamHaven has already revolutionised the way we work, enabling us to react quickly to fast moving market trends. This partnership means we can now communicate with field staff even faster and greatly improve our efficiency. Thanks to PageOne's Connect, we will now be able to contact individuals, specific groups or the whole team at the touch of a button." TeamHaven distributes call plans and data capture forms directly to wireless PDAs in the hands of Cadbury Trebor Bassett field staff. The field staff simply record the information required as they visit their customers, with the information automatically sent and synchronised in real time with the TeamHaven server. "It all began with a recommendation from Orange," said Steve Grimes, CDS Chairman. "We then contacted PageOne, and were immediately impressed by the team and the fact that they have their own highly secure network. Our business is global, so it was important to choose a partner who could meet both our technical and commercial requirements not just in the UK but all over the world." Philip Clement, PageOne's Channel Development Manager enthused: "We find TeamHaven a hugely exciting product that is changing the way people work in the retail marketing sector. Most companies have to wait a week to get information back from the field - with TeamHaven it's instant, enabling sales staff to make decisions on the fly! Including PageOne's Connect means there is an extra level of communication at a manager's finger tips, giving them the added advantage of responding quickly to customer trends." PageOne has been providing award winning wireless messaging solutions for nearly 20 years and has established a track record of leading the field in the introduction of innovative products and services. PageOne owns and operates a UK paging network and provides business SMS messaging solutions; PageOne Paging and PageOne Connect respectively. All PageOne systems are powered by the company's own flexible platform Oventus, developed to enable the seamless integration of mobile messaging across different networks and technologies. These services have consistently been designed to meet and exceed the demands of an increasingly mobile environment, providing reliable and cost effective communications to thousands of organisations across the government, NHS and major corporate sectors. TeamHaven has been adopted by a number of field marketing organisations to manage out of office field employees, coordinating all aspects of a successful field marketing or sales project. Call files, visit schedules, field representative assignments, data collection and data reporting are all handled through one web-based application.